The National Disaster Management Plan cleared by Modi government in 2015 allows voluntary aid from governments of other countries. 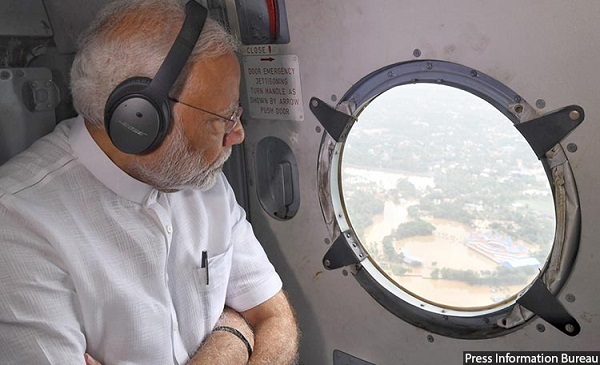 The Prime Minister, Shri Narendra Modi conducting an aerial survey of flood affected areas, in Kerala on August 18, 2018. The Centre has refused to accept aid relief of Rs 700 crore ($100 million) from the United Arab Emirates, citing policy, but its own 2015 policy allows such aid to be accepted “as a goodwill gesture”. “The Government of India deeply appreciates offers from several countries, including from foreign governments, to assist in relief and rehabilitation efforts after the tragic floods in Kerala. In line with the existing policy, the Government is committed to meeting the requirements for relief and rehabilitation through domestic efforts,” according to an official statement from the ministry of external affairs on August 22, 2018. That is contrary to the government’s official policy. “If the national government of another country voluntarily offers assistance as a goodwill gesture in solidarity with the disaster victims, the Central Government may accept the offer,” says chapter 9 of The National Disaster Management Plan (NDMP), cleared by Prime Minister Narendra Modi’s government in 2015. The home ministry should coordinate with the external affairs ministry–the agency primarily responsible for reviewing offers of foreign assistance–and the concerned state government, if it is to accept foreign aid, the NDMP states. Quoting the NDMP, Kerala chief minister Pinarayi Vijayan and finance minister Thomas Isaac have asked the Centre to accept the offer. If the Centre remains silent or rejects the offer, Vijayan and Isaac have said that Delhi must compensate the state for the missed opportunity to receive funds offered as goodwill. Faced with the destruction left by the worst monsoon floods in 94 years, 1.2 million in relief camps and now over 400 dead, Kerala has been appealing to the public and private donors to help reconstruction efforts. Kerala is facing its worst flood in 100 years. 80 dams opened, 324 lives lost and 223139 people are in about 1500+ relief camps. Your help can rebuild the lives of the affected. Donate to https://t.co/FjYFEdOsyl #StandWithKerala. The state has requested financial aid of Rs 2,200 crore ($286 million) from the Centre, but just over a third has been pledged so far. The Rs 600 crore Central aid is less than the cost of one Rafale fighter jet (Rs 670 crore), 36 of which India hopes to buy from France, IndiaSpend reported on August 22, 2018. We asked Union Gov for financial support of ₹2200 Cr ; they grant us a precious ₹600 Cr . We make no request to any foreign gov but UAE gov voluntarily offer ₹700cr. No, says Union gov , it is below our dignity to accept foreign aid. This is a dog in the manger policy. India received Rs 950 crore in foreign aid from a mixture of inter-governmental organisations and individual nations in 2016-17, according to this response to a Lok Sabha question in March 2017. Over the past decade, the UK has been the largest donor of foreign aid, followed by The Global Fund, an international financing organisation to fight AIDS, tuberculosis and malaria, and the European Union. 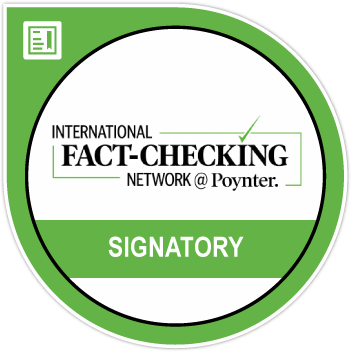 This article was first published on factchecker.in. Send us your "name" & language as "English" or "Hindi"
Fact-check: Did Modi Say, “I Don’t Believe In Hindu Dharm”?